Anthony Beuchaw joined God’s team of angels on Friday, March 1, 2019 at the age of the 18. Anthony was born on November 29, 2000 in Norman, Oklahoma. While growing up, he attended Briarwood Elementary and Brink Jr. High and was currently a Senior at Southmoore High School where he was an accomplished and dedicated member of the football team having played the position of offensive lineman. Young, competitive, athletic and disciplined, Anthony excelled in all of his endeavors. From a young age, He enjoyed playing many sports and was an avid OU Sooners fan. He made the most of any opportunity he was given. 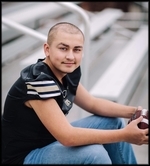 Anthony was diagnosed with malignant germinoma in his basil ganglia, but was a mighty warrior in his battle with cancer and rejoiced for his time in remission from December 2017 to June 2018. His fellow friends and peers at Southmoore High School loved his zest for life, his contagious smile, jovial sense of humor, committed passion and enduring compassion in all he embraced. Anthony’s presence on earth will be inconceivably missed each day, but his spirit will continue to live on through each of us as he will never be forgotten. Anthony was an inspiration to us all in how to live to make each moment count in life. And his many aunts, uncles, numerous cousins and countless friends.